Darragh Lynch, architect for the WISER project, presented at the QualiBuild conference on the 21st of June. Darragh spoke about the WISER Life+ project, as it is a prime example of a sustainably-focused build. 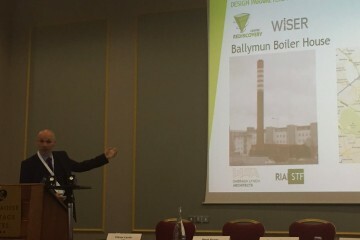 He specifically discussed how green buildings are ecologically designed and constructed, with the retrofit of the Ballymun Boiler House being a particularly interesting case study, as the building was originally designed to be heat-inefficient in order to prevent the boilers from overheating. Once the retrofit is completed, the old Boiler House will produce 90% of its own energy and will boast organic hempcrete wall insulation and a rainwater harvesting system that feeds into a water filtration loop, showing that with a bit of innovation and green-minded designing, buildings like the Boiler House can be given a new, greener, life.